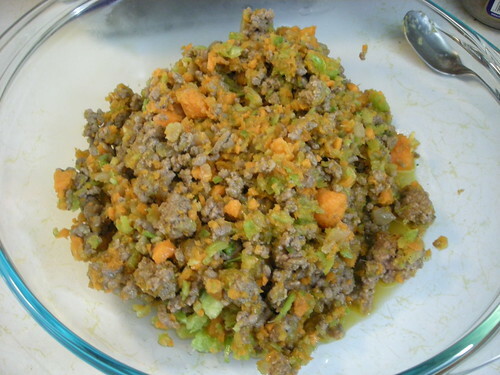 For 2009, I’m trying to take on more Filipino food in the kitchen. Over the last few years, I’ve figured out how to make different types of dishes, from paella to chili. However, Filipino cuisine has not been a priority for me. I think it’s because my family cooks up all my favorite dishes on my So Cal visits. Some day, I will have my own kids to raise. I want them to grow-up with the same yummy aromas I remember from my childhood. So, I need to figure out how to make my favorite foods in my kitchen. 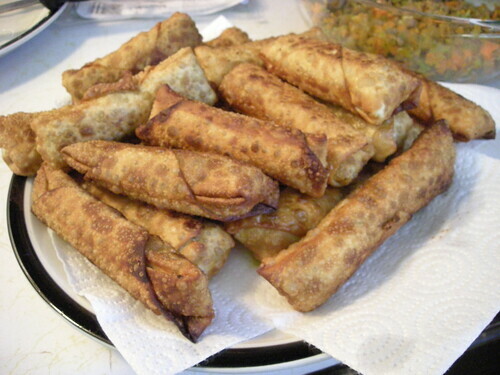 Last month, I made this batch of lumpia for the first time. Now, my parents typically buy the frozen ones from the Filipino store and fry them up at home. 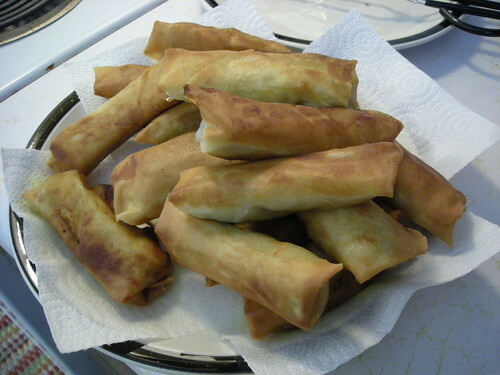 However, I remember having fresh lumpia as well – after my trips to Manila and from my cousin in Oceanside. 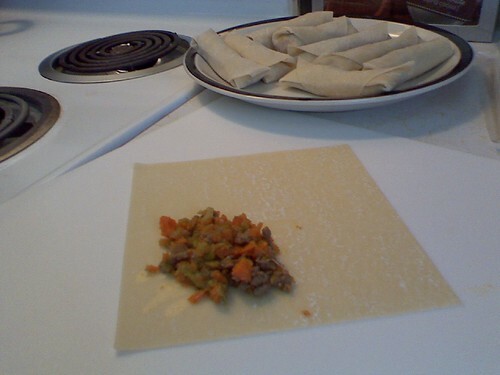 Chopping up veggies, frying up the filling and rolling the lumpia wrappers takes up a lot of time. It makes since to buy the frozen stuff for big parties. Still, I figured I can make my own when it’s just the hubby and me at the dinner table. I used a wok to make the lumpia filling. I fried up the ground beef with peanut oil, salt and pepper. After I browned the meat, I added the chopped up veggies to the wok. I also added more salt and pepper plus a few dashes of patis. 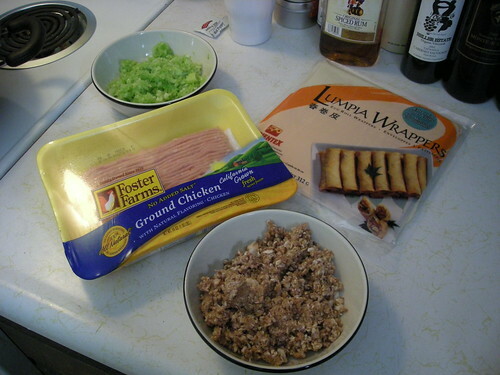 Next up, lumpia rolling time. I placed the cooked lumpia filling in a bowl. I also had a small bowl of water on the side. For this first attempt at lumpia, I used Azumaya wrappers. They were thick, sturdy and easy to use. I used the instructions printed on the Azumaya package for guidance. I positioned the wrapper in a diamond shape in front of me. I added a small spoonful of the filling near the pointy end of diamond and started rolling it up (what I have in that picture above was too much filling! It helped to go with a smaller spoonful). All the lumpia recipes I’ve study advised to keep the rolling as tight as possible. Then I foldded in the pointy wrapper ends on the right and left. Finally, before I finished rolling, I added a dab of water at the last pointy end to seal the lumpia roll. Got it? If not, this YouTube video clearly demonstrates how to roll up the lumpia. Frying time! I poured vegetable oil into the wok. After it heated up, I added the lumpia rolls. I fried up about 4 at a time. 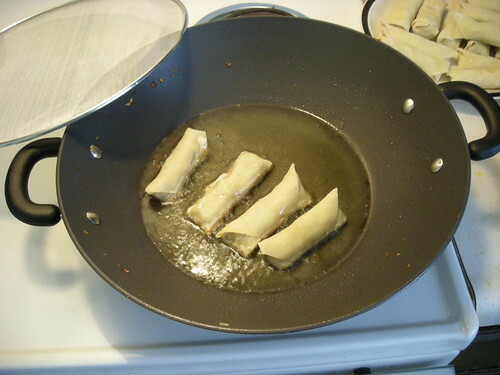 Once the oil is hot, the lumpia frying goes by quickly. I used tongs to flip the rolls, browning all sides. Eating time! 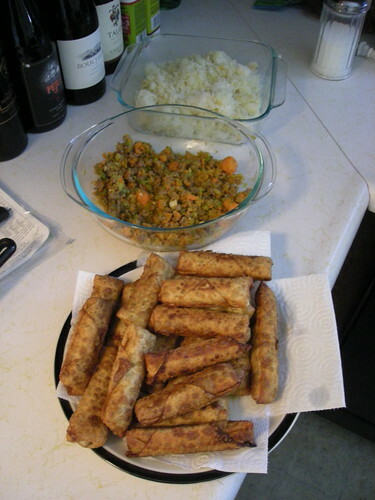 I served up the lumpia with fried white rice and garlic. I also made a dipping sauce with soy sauce, garlic and rice vinegar. My hubby loved the lumpia. Still, I liked the thin, crispy texture of this batch. On both attempts, I had leftover filling. I also noticed that microwaving the leftovers killed the crispy goodness. So I ended up frying leftovers in the wok. Next time, I’m only going to fry up what I plan on eating that day and freeze the rest. Pingback: Queenkv’s Brainpickings » Blog Archive » Forget Baskin-Robbins!